Stage Hands Massage and our West Coast Tour Coordinator, Silvana Marroche are featured in a recent issue of Rock Thiz Mag. Read more here! I am certainly not star struck after massaging celebrities all these years, and I NEVER blog about them either....but, people do ask me if I could meet any celebrity who would it be. I thought about this one, and answered Keanu Reeves (because he's hot!) and Jack Black (because he's the funniest man alive). Well, I can check Jack Black off my bucket list, because last night I had the opportunity to work on him at Lupos Heartbreak Hotel in Providence, RI. He was the most down-to-earth, genuine celebrity yet....and of course funny! He tops my list alongside Michael McDonald as my all time favorite celebs! Read all about it on Page 8! 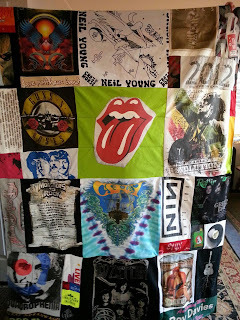 The Rock and Roll quilt-pillow (QUILLOW) is complete! 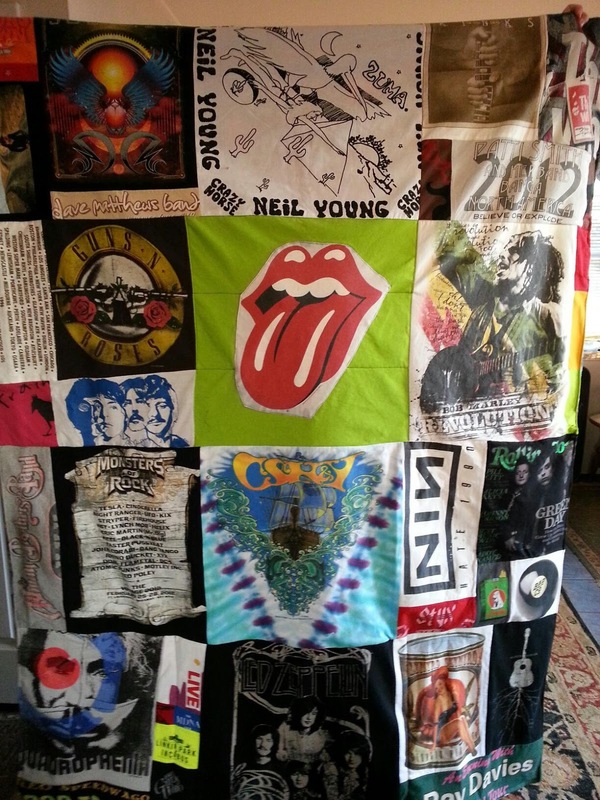 With the help and expertise of Dale Noelte Gardner...amazing artist and friend http://www.daleofnewport.com/ the quilt is comprised of vintage rock and roll t-shirts donated by friends and industry peeps. Special thanks goes to Nick Gold,- Entertainment Travel, Cindy Gottfried- Hands That Rock, & Gina Fugitt-McNamara - Bearcom. The quilt measures 50x60 and folds into a pillow when not in use. The quilt will be auctioned off for charity with the proceeds to benefit, Little Kids Rock. 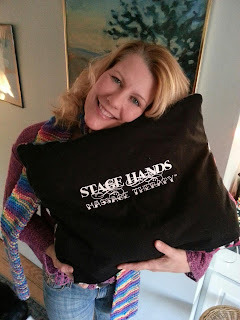 The auction item can be found on www.handsthatrock.org. Bidding starts at $200.